How to cook an acorn squash in your instant pot. Under 20 minutes flat. Carefully cut your squash in half down the middle. Use an ice cream scoop or spoon to remove the seeds from your squash halves. Place steamer basket into your Instant Pot along with your 1/2 cup of water. 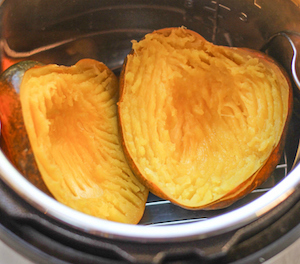 Add your squash halves to your Instant Pot and lightly sprinkle with sea salt. Close lid, set pressure valve to sealing, set to manual (high pressure) for 5 minutes. Perform a quick release of the pressure immediately after the cooking program finishes. Use a fork to pull out your cooked squash from it’s shell, or allow to cool and remove meat by hand and enjoy! For firmer squash, reduce cooking time to 4 minutes. For softer, delay your quick release time by a few minutes.